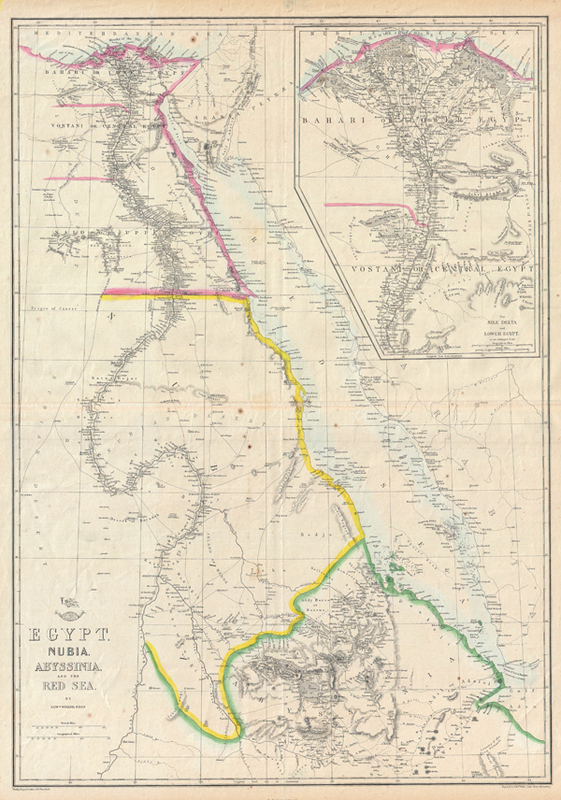 Egypt, Nubia, Abyssinia, and the Red Sea. This is a hand colored map of Egypt, Nubia and Abyssinia, dating to 1858, by London cartographer Edward Weller. Depicts northeastern Africa from what is today central Ethiopia, northward along the Nile to Egypt and the Delta. Shows the Red Sea in full along with parts of Saudi Arabia. An inset in the upper right quadrant details the Nile Delta and Egypt's Central Valley. Notes Mount Sinai as well as the location of many ancient Egyptian ruins. Originally part of the Weekly Dispatch Atlas, whose September 19th, 1958 stamp still appears on the top left of the map. Cassell’s Weekly Dispatch Atlas c. 1858.